The U.S. Mint's first and only modern commemorative half-dollar in 90% silver! 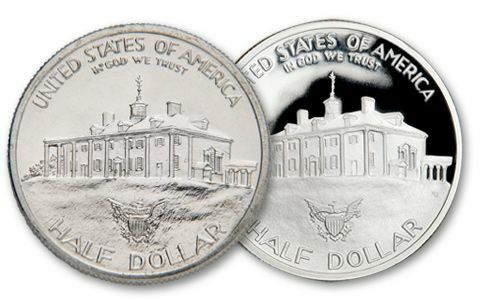 Back in 1982, the U.S. Mint hadn't produced a commemorative half dollar for nearly three decades. 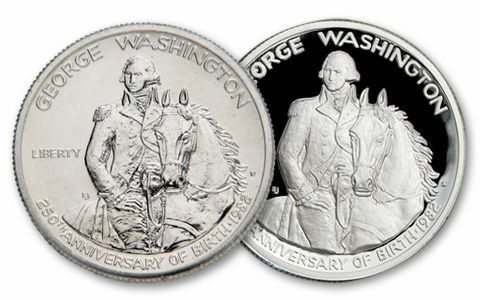 So, in celebration of George Washington's 250th birthday, it decided to revive the tradition - striking 90% silver halves in Brilliant Uncirculated (BU) and Proof condition. These milestone Washington coins represented the first-ever modern U.S. commemoratives, and they were the only modern commemorative silver half-dollars. 30 years later, you can still get both - for 31% less than you might pay for each coin elsewhere! And, if that already sounds like a bargain, just consider the fact that vintage silver commemorative half-dollars in proof condition can command astronomical sums, like the rare PR66 1892 Columbian Half-Dollar that sold earlier this year for $12,650! Will these two 1982 George Washington Commemorative Silver Half-Dollars ever match that number? We'll have to wait another hundred years or so to see. But, that doesn't mean you can't snap up these coveted silver firsts today, while they're still affordable! No collection of modern U.S. coins can be complete without these first-ever Silver Half-Dollars.